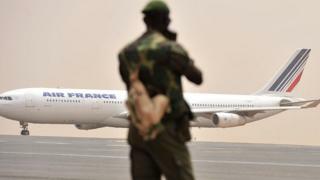 Mali has sent back two people who were deported from France on the same planes they arrived on, questioning whether they were even Malian citizens. The pair were flown to Bamako using European travel permits or "laissez-passer", not passports or other Malian papers, the government said. The government said it could not accept people "simply assumed to be Malian". Recent reports of a deal with the EU to repatriate failed Malian asylum seekers have sparked protests. In a statement, the Malian government condemned the use of the European "laissez-passez" in cases of expulsion, describing it as "against international conventions". It also warned airlines not to let people using the document fly to Mali. The French authorities have not yet commented. Mali's refusal to admit the two migrants comes as Bamako is under fire at home for having signed a ''migrant return agreement'' with the European Union. Many Malians claim the government has betrayed them by accepting €145m ($153m; £124m) for ''measures to deter migration''. The deal, announced on 11 December, was the first of its kind between the EU and an African country. The Malian anti-corruption group "mains propres'' (clean hands) says the authorities in Bamako were tricked by Brussels, whose own rules require such an agreement before mass expulsions can be triggered..
Bamako and Brussels are now both playing the deal down as ''an agreement with a small A'' or ''a communique on deepening migration partnership''. The EU has since signed a similar document with Niger, which is another major departure country for migrants heading through the Sahara desert on their way to Europe. There is a large Malian community in France, the former colonial power, who support their relatives back home by sending money. More than 360,000 people have reached Europe by crossing the Mediterranean this year. Many pass through Mali on their way although Malians are not among the 10 nationalities most likely to attempt the journey. A $1.9bn (£1.2bn) European Union-backed fund to tackle African migration was announced in November 2015, with African leaders agreeing to allow the return of failed asylum seekers in return for development aid.